Cody Young (HAW) and Brisa Hennessy (HAW) won the Vans US Open of Surfing Pro Junior event today. 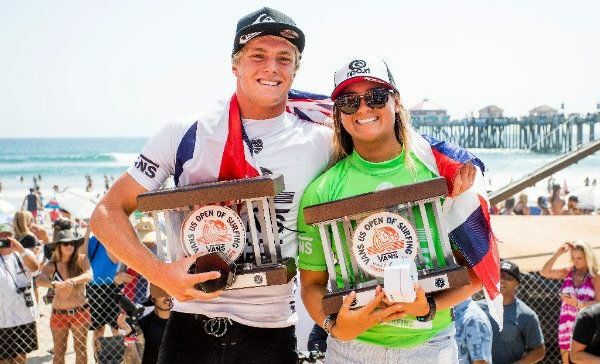 HUNTINGTON BEACH, California/ USA (Saturday, August 5, 2017) – Cody Young (HAW) and Brisa Hennessy (HAW) have won the the World Surf League (WSL) Vans US Open of Surfing Pro Junior in consistent three-to-four foot (1 metre) conditions at the southside of the Huntington Beach Pier. In addition to the action today, tomorrow will see elite performances with the conclusion of the Women’s Championship Tour and Men’s Qualifying Series (QS) 10,000 events. Hennessy continues to be a threat on the international level with her first-ever Vans US Open win in defining fashion. The 17-year-old South Shore, Oahu local showcased her talent to find her way into the Final where she blasted an excellent 8.67 on her first opportunity. Hennessy battled with two-time event winner Caroline Marks (USA), last year’s CT event wildcard Meah Collins (USA), and current European Pro Junior Tour No. 1 Teresa Bonvalot (PRT). But, the 17-year-old Hennessy backed up her excellent ride with a 6.33 to regain the lead from Bonvalot and secured her victory. Brisa Hennessy (HAW) flew through the Final to take her first Vans US Open of Surfing Pro Junior event. Action then shifted to the Men’s Pro Junior Final and fireworks awaited right off the first horn. Kade Matson (USA) got straight to work with a near-excellent 7.67 on his opening wave, but eventual winner Young shadowed that ride with a brilliant 8.33 to open his account. Matson then earned the lead back with a 5.90, but once again was overtaken by Young with a 7.13. Reef Heazlewood (AUS) made a late charge under the ten-minute mark, but fell short of the 8.63 requirement and earned an 8.10. Barbadian talent Che Allan’s (BRB) final few attempts yielded no success and Young emerged victorious. Cody Young (HAW) showcased his powerful surfing to claim victory at the Vans US Open Pro Junior event. Ahead of the Women’s and Men’s Pro Juniors Finals, the Vans US Open of Surfing Men’s QS 10,000 completed their Round 5 head-to-head match-ups to determine the Quarterfinal draw for tomorrow’s finish. Hometown hero Kanoa Igarashi (USA) is back into another finals day at his beloved Huntington Beach after a dominant performance over fellow CT competitor Stuart Kennedy (AUS). The 19-year-old’s local knowledge is nearly unmatched at this event and Igarashi continues to utilize it to advance through each heat. Defending event winner Filipe Toledo (BRA) nearly met his match in a relentless Davey Cathels (AUS) that witnessed the two exchange leads numerous times until the final buzzer. It was no easy task for Toledo against the fighting spirit of Cathels, whose power-surfing edged out the Brazilian’s air-game on a critical exchange that earned him a 7.00 over Toledo’s 6.87. The exchanges continued as the five-minute mark drew closer and Toledo’s 6.07 put him out front, but Cathels’ 6.00 earned the Australian another lead change. But, Toledo wasn’t done and found a critical forehand snap before two quick maneuvers on the inside to earn a massive victory. Ricardo Christie (NZL) began the day with a big performance over 2015 event winner Hiroto Ohhara (JPN) as he looks to requalify for the Championship Tour (CT). The New Zealand representative is searching for his best result at a QS 10,000 since 2015 where he earned an equal third. But, Christie’s momentum may be something to help carry him against the in-form Igarashi in a rematch from Round Three earlier this week. Michael February (ZAF) is on his way to another big QS 10,000 finish with his Quarterfinal berth today. The current QS No. 4 has room to move with both QS ranked No. 3, Yago Dora (BRA), and No. 2, Willian Cardoso (BRA), out of the event. February’s explosive surfing continues to impress at Huntington Beach with his signature style — earning a huge win over Dusty Payne (HAW) with the round’s only excellent score of an 8.00. Former CT competitor Patrick Gudauskas (USA) dispatched Italo Ferreira (BRA) on a buzzer-beater 6.70, needing a 4.90 heading into the dying minutes. But, Gudauskas’ fellow San Clemente surfer Griffin Colapinto (USA) was not as fortunate with Brazilian threat Tomas Hermes (BRA) taking a big win. The Vans US Open of Surfing will see its final day of competition tomorrow with the Women’s CT and Men’s QS Finals Day called on. The Men’s QS will start the day at 7:30 a.m. with the Quarterfinals. The Vans US Open of Surfing will be broadcast LIVE from July 31 – August 6 via VansUSOpenofSurfing.com, WorldSurfLeague.com, the WSL app and on Facebook LIVE via the WSL’s Facebook page. Also check local listings for coverage on CBS Sports Network in the U.S., Fox Sports in Australia, ESPN in Brazil, Sky NZ in New Zealand, SFR Sports in France and Portugal and as part of the EDGEsport Network. For more information, check out WorldSurfLeague.com and for continued updates and scheduling for the Vans US Open of Surfing visit VansUSOpenofSurfing.com.